Home > Hinduism > Hinduism Practices > Namaste > Should one do Namaskar to a dead body? Do we do Namaskar to the dead bodies in Kaliyuga only as a custom? Could one do Namaskar to God and then pray, instead of do Namaskar to the dead body? 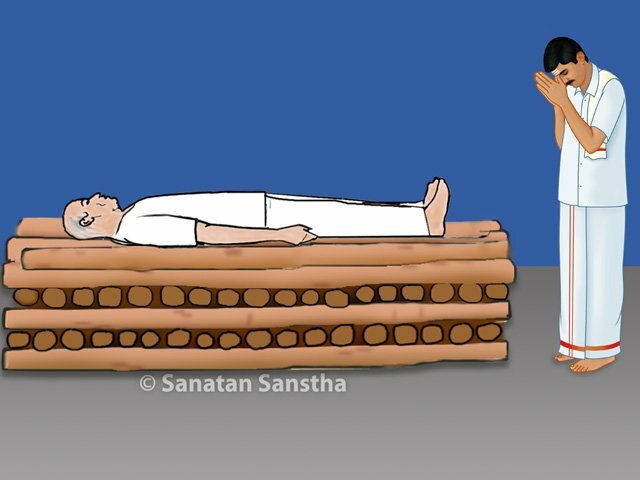 By touching the dead body, then are the chances of getting distress from negative energies? Q. 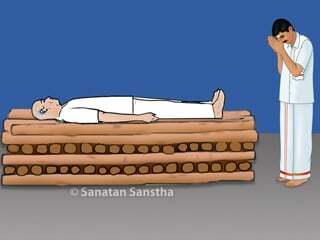 Should one do Namaskar to a dead body? A. ‘The embodied souls from the Tretayuga and Dwaparyuga were more sattva predominant as compared to the embodied souls of the Kaliyuga. During the Treta and the Dwaparyuga the embodied soul undertaking spiritual practice used to gain Godly momentum after leaving its physical body. Doing Namaskar to a dead body is actually doing Namaskar to the Godly momentum gained after accomplishment of its work in this world and which takes it towards God. This is also symbolic of expressing respect towards the subtle body of an embodied soul. In the present era, as per the path of rituals (Karmakand) there is a custom of praying first for the sake of the dead body – ‘let the subtle body of the departed attain good momentum to reach the next region’; and then doing Namaskar to the body. Q. In Kaliyuga, there is a custom of praying first to God that, ‘let the subtle body of the departed gain good momentum to reach the next region’; and then doing Namaskar to the body. However could one do Namaskar to God and then pray, instead of doing Namaskar to the dead body? A. If you do this, it will become impossible to set an ideal for embodied souls in Kaliyuga; this act symbolizes how one should ‘respect the elders and seniors’. For the present generation in Kaliyuga, which is becoming unrighteous, there is only one effective way of teaching them and that is through actually performing the required actions. The embodied souls in Kaliyuga are ignorant about the underlying spiritual view point, hence now it is very important that they be taught everything actually by performing actions like doing Namaskar. If one prays to God for the departed and does Namaskar mentally, the people present will not understand its importance; because understanding these things requires spiritual ability. Since the embodied souls in Kaliyuga are devoid of this ability, it is of utmost importance to perform visible actions. That is why it is appropriate to do Namaskar to the God principle in the dead body. Due to this act, one aims to benefit at the emotional and spiritual level. 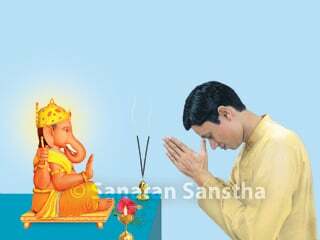 What is the correct method and science of doing Namaskar to God ? Why we should not do Namaskar with one hand? 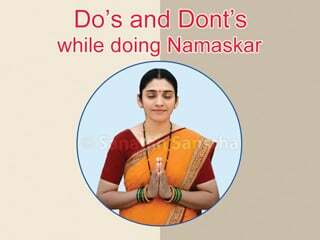 To whom one should not do Namaskar ? How should a Husband and Wife do Namaskar together?